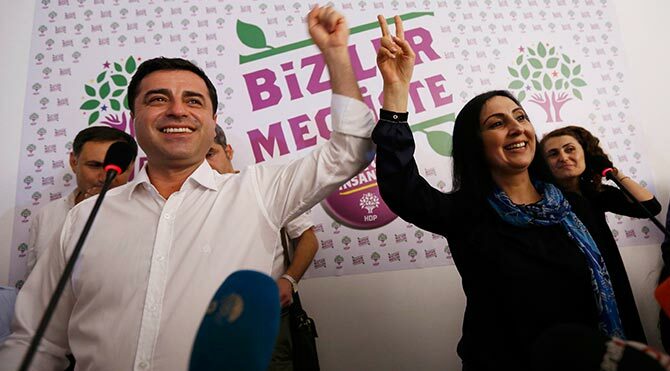 Co-chairpersons of the pro-Kurdish Peoples’ Democratic Party (HDP) Selahattin Demirtaş and Figen Yüksekdağ were arrested by a Turkish court on Friday afternoon after they were detained along with nine other HDP deputies following police raids in their houses in the early hours of Friday, state-run Anadolu news agency has reported. Three of the detained deputies were arrested while two were released on probation earlier on Friday. The remaining deputies were referred to court for arrest . After the government’s lifting of parliamentary immunity in June, mainly applicable to HDP deputies in practice, President Recep Tayyip Erdoğan made clear that the new law would be used to prosecute HDP deputies on “terrorism” charges rather than lawmakers linked to corruption. The Republican People’s Party (CHP) and the Nationalist Movement Party (MHP) extended their support to the AKP to abolish parliamentary immunity of deputies facing potential prosecution.